See also: FM DX and TV DXing from this location. KVNS 1700 Brownsville 1-28-11 8.8/880w Not DIR Classic Hits (Only One) // online as well. 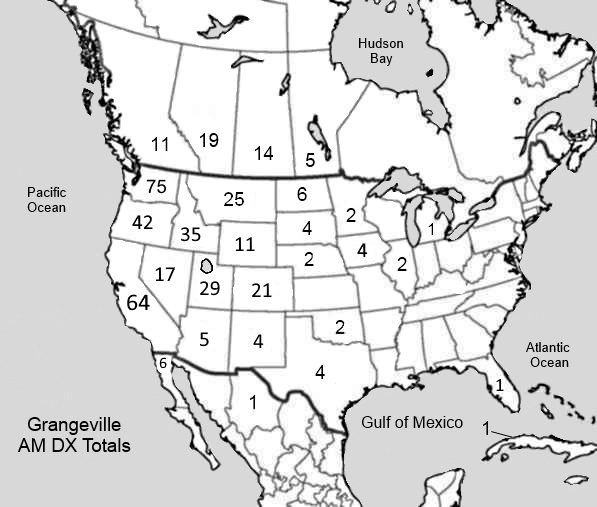 LEFT MAP: Totals per state/province. RIGHT MAP: Locations of stations received. BELOW: Close range. To see full sized versions of the maps, simply click them. Stations indicated with after the city of TX were picked up on the date indicated. DIR - Directional antenna, may show D or N which means Day or Night. Sony SRF-M37W - DX walkmn. Stock radio inside 2007 Toyota RAV4. Old Radioshack Multiband SW/FM/AM radio.